**We've got a few new menu changes, so please refer to the Home Page for the latest one and download for your eating pleasure! 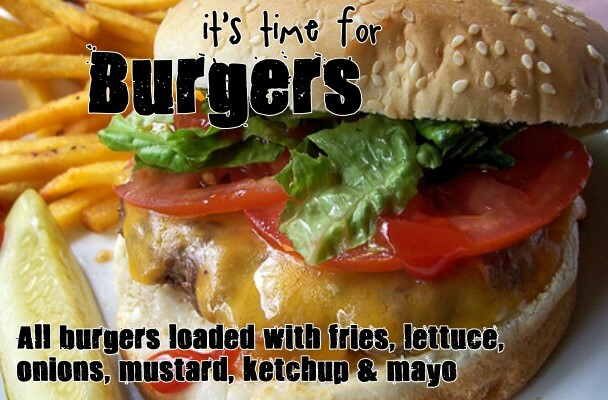 Your Favourite Burger Loaded with the Works! BBQ Burgers never tasted so great! Cheese, Bacon & Sautéed Mushrooms. Traditional, Yummy and Everyone's Fave! Try it. We love it. 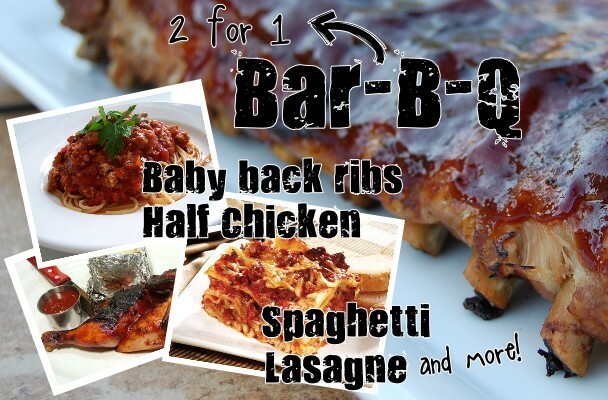 2 for 1 BBQ Ribs, Chicken 'n Pasta Dinners are Being Served! 2 Baby Back Ribs (full rack) & 2 Spaghetti or Lasagna, Green Salad & 2 Garlic Toast. 2 Half BBQ Chicken & 2 Baked Spaghetti or Lasagna, Green Salad & 2 Garlic Toast. Combination Ribs (full rack) & Half Chicken served with Green Salad, 2 Baked Spaghetti or Lasagna & 2 Garlic Toast. TAKE OUT OR HAVE US DELIVER. No Substitutions Please. Prices Do Not Include Tax. Prices Subject to Change. Drop in for Take Out. Deliveries for $20 or more after tax.